I went to pick my Mom up a few days ago at her assisted living facility for a pre-planned family lunch and found her room empty. I finally discovered her sitting under the hairdryer at the facility’s salon where she was both shocked and delighted to see my daughter and me. I had called her earlier in the week to invite her to lunch. I called her the day before the lunch to remind her we were coming. She still forgot. 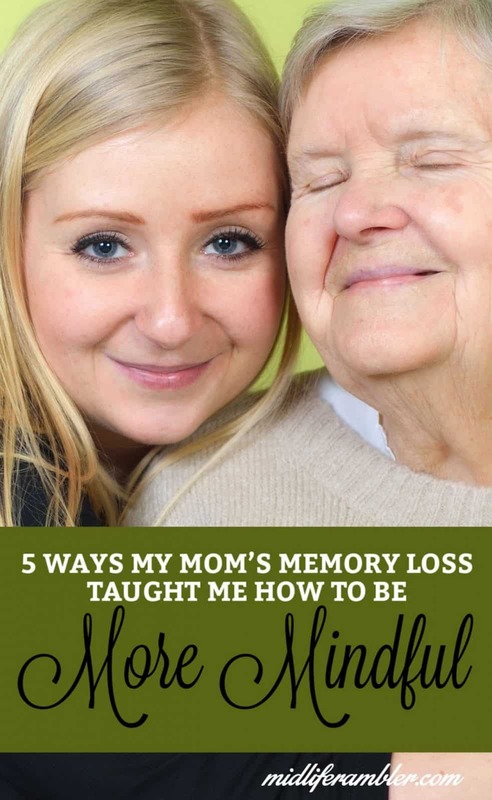 My 89-year-old mom’s short-term memory is unreliable and she’s lost many of her past memories. But – here’s the thing – she seems to be much happier. She’s become the master of living in the present moment because the present moment is all she has. Watching her at lunch, I realized she was the perfect teacher to help me with my current focus on being more mindful in life. Here are five things I learned from my Mom on how to live a more mindful life. In her earlier life, my Mom would have been appalled by someone showing up without notice to take her to lunch. Any type of outing required planning, lists, and wardrobe decisions. My in-the-moment Mom grabbed her purse and was ready to go when we showed up to take her to lunch. Instead of fretting about the change in routine, she just went with the flow. As we walked to the car for our lunch date, my Mom told my daughter and us repeatedly how beautiful we looked. I could see that each time she said it, she was sincerely thinking to herself, “This is my daughter and granddaughter and I love them. They are so beautiful. I’m going to tell them.” She sparkled with joy and excitement as she savored our visit. She didn’t worry about anything that might happen or anything that had happened because she lives only in the present. 3. Don’t worry about the future. My mom, when she was the age I am now, was an even bigger worrier and over thinker than I am now, and I, if I may be so bold as to make this claim, am currently the word champion, the Simone Biles, if you will, of unwarranted worry. I only live in the present moment when I stub my toe. But, worrying about the future is a thing of the past for my mom because she’s forgotten about all the things she used to worry about. 4. Accept that the past is in the past. We all fall victim to ruminating on past hurts and failures. I certainly spend more time on this than I should. But my mom is free of all that. To her, past memories are, at best, a gauzy blur and so they know longer hold any appeal. She is too busy focusing on the moment in front of her to take the time to think of any regrets she might have. 5. Enjoy and Appreciate the Present Moment. My lunch with my mom was an utter delight. She smiled through the entire meal, wolfed down her grilled cheese sandwich and broccoli with obvious enjoyment, and basked in her grandchildren’s love. My mom lives purely in the present moment without judgment. She’s become the ultimate Zen Master. Being with her, I saw the benefits of experiencing each moment life hands to you without judgment. I saw how happy and free my mom is now that she’s forgotten the things that she always thought were so important and I want that for myself. And now I know how to get it. When you live fully in the moment, you see how life is just a series of events. My mom may not even remember our wonderful lunch, but it doesn’t really matter because she’s thinking about what’s happening to her right now. And someday, she may not remember me, but I think when that day comes, she’ll be excited to meet me for the first time. Just as excited as I’ve been to finally meet my mom. Next Post Frustrated by Generational Labels? Pick a New One. Excellent article! It really helped me today. I have got to stop worrying about the future and enjoy today! This is such an important post, Katie! 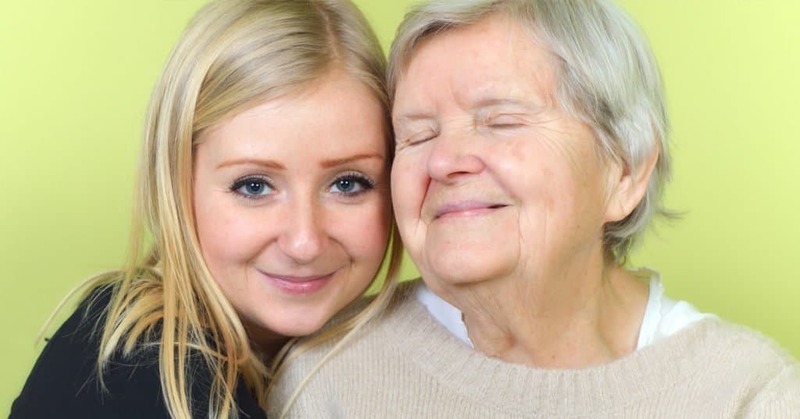 At our age, our elderly parents are losing their memories a little every day. My mother-in-law and my mom, both have dementia, and both have physical limitations that prevent them from even going out to lunch. Savor your moments with your mom. I really loved this idea of living in the moment and perhaps our dulled memories will enable us to do just that one day. Thanks Terri. There’s an upside to everything, right? My mom had a lot of worries and anxiety and now she is finally free. This is such an amazing blog post. Always important to find the good in things. Godspeed to you, your mother, and your family! So glad I ran across this post just before heading to my mother’s house to meet a repairman, since she can’t remember what’s broken. She’s 91 and in early stage Alzheimer’s, but like your mom, gets happier every day. There is such a good lesson in that for all of us, and your post was a great reminder, especially for those of us who are caregivers. Thanks for this, and I look forward to being a regular reader in the future. Thanks so much for commenting! I wrote this post as a little reminder to myself that even distressing change can have a good side. So happy you found it helpful. My Dad is the one. He’s in denial, though. What a rough road – it seems sad. I hadn’t really considered looking at this loss as a positive. Thank you for helping me shift my thinking about the path his 80’s are taking him down.